When a group wants to generate ideas for a new product or to solve a problem, you will usually hear the clarion call, “Let’s brainstorm!” You assemble a group, spell out the basic ground rules for brainstorming (no criticism, wild ideas are welcome, focus on quantity, combine ideas to make better ideas) and then have people yell out ideas one at a time. Brainstorming is often the method of choice for ideation, but it is fraught with problems that range from participants’ fear of evaluation to the serial nature of the process — only one idea at a time. Brainwriting is an easy alternative or a complement to face-to-face brainstorming, and it often yields more ideas in less time than traditional group brainstorming. When I teach my graduate course in “Prototyping and Interaction Design,” I start with a class on ways to generate ideas. Because brainstorming is a well-known and popular technique, I generally begin with a discussion on how to do good brainstorming, something that is very hard, and then introduce brainwriting as a worthy, and sometimes preferred, alternative to brainstorming. The term “brainwriting” often brings forth smiles and quiet laughter because it is a strange word. Brainwriting is simple. Rather than ask participants to yell out ideas (a serial process), you ask them to write down their ideas about a particular question or problem on sheets of paper for a few minutes; then, you have each participant pass their ideas on to someone else, who reads the ideas and adds new ideas. After a few minutes, you ask the participants to pass their papers to others, and the process repeats. After 10 to 15 minutes, you collect the sheets and post them for immediate discussion. In my experience, the number of ideas generated from brainwriting often exceeds what you’d expect from face-to-face brainstorming because you’ve reduced anxiety somewhat, followed a parallel process in which a dozen people may add items simultaneously, and reduced the amount of extraneous talk that happens during brainstorming, which takes time away from idea generation. You have too large a group for effective brainstorming. You could conduct brainwriting at a conference of 500 people simply by leaving a large card on each seat, asking a question, and then having each audience member pass a card to someone else, and then repeat three times for a minute of writing. You have quiet people in your group who are intimidated by traditional brainstorming. You are working in a culture in which brainstorming about “wild ideas” or expressing ideas that diverge from those of senior management is not accepted. Your time is limited. I’ve used brainwriting to brainstorm questions for a website visit when I had only 10 minutes to get feedback from the product team. I ended up with more than 50 different questions, without the fuss of having to set up a formal brainstorming session. You don’t have an experienced moderator. Brainstorming, contrary to what many blog posts claim, is difficult to do well. Brainwriting, in contrast, requires that you be able to ask a question, read a clock and collect answers. You are worried about loud or forceful individuals influencing others, as they might in traditional brainstorming. Brainwriting can be used to understand how different groups view an issue. You might try to conduct separate brainwriting sessions with different internal groups. For example, if you asked groups to brainwrite about “What are the most important problems faced by our customers?” you might find that developers have a different perspective from the UX team, who have a different perspective from product managers. In my experience, the differences emerge more strongly through brainwriting than through face-to-face brainstorming. While brainwriting is easy and accepted in many environments after a single demonstration of its productivity, you might want to avoid brainwriting in a few situations. There may be times when your colleagues find it difficult to express ideas in writing. If you are working on complex issues, then you might want to opt for small group brainstorming or another ideation technique that allows for clarification and discussion. If you are forming a team, then you might want to opt for traditional brainstorming, because participants will be more familiar with that method (rather than the strange name “brainwriting”), and the social interaction will foster team-building. You might want to avoid brainwriting if you are in a culture with strict rules about which methods and procedures to follow. People who follow a highly structured product design and development process might find brainwriting a bit too radical. My first suggestion is to search for “brainwriting” on the Web and peruse some of YouTube videos and short articles that describe brainwriting techniques and tips. There are several approaches to brainwriting: interactive brainwriting, the 6-3-5 method, the idea card method, and the remote spreadsheet method. We’ll cover the basic procedure for each of these techniques. Hand out paper for each person to write down ideas. Describe the timing of the brainwriting (for example, three minutes for the first round, and two minutes for four subsequent rounds) and the process for passing the pages (for example, counterclockwise around a table). A page-passing process that is not clear could undermine the credibility of the method and waste time. Ask if anyone has any questions about the problem statement or the brainwriting process. Remind people to read the ideas quickly before entering their own ideas and to feel free to add, modify and combine ideas. Let people know that extra paper is around the room if they run out. Begin the rounds. Announce the end of each round, and ask people to pass their paper to another person. At the end of the session, collect the brainwriting pages and post them for comment, additional ideas or review. In brainwriting 6-3-5, six people are given a form and asked to provide three ideas for solving a problem in five minutes. 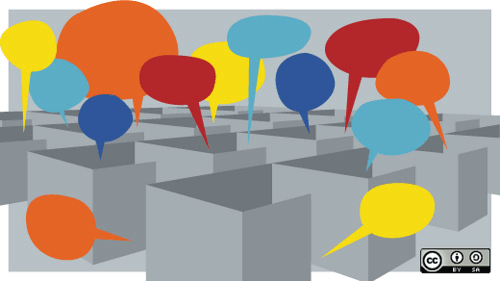 Participants are invited to consider out-of-the-box ideas and to combine ideas with others. The ideas are written in silence to prevent participants from influencing each other. After the first five minutes, each participant passes a form like the one below to the adjacent participant, who then reviews the ideas and adds new ones. The process is repeated six times, with a potential for 6 × 3 × 6 (or 104) ideas. In practice, I’ve found that people often come up with more than three ideas in five minutes, so you could create a 6-6-5 form. This approach to brainwriting gets participants to write ideas continuously on sticky notes or cards and, as they finish a card, to place it off to the side. When other participants need inspiration, they can take a few cards from their colleagues and continue. Each card would hold only one idea. If you want to conduct remote brainwriting, you can use Google Spreadsheet as a brainwriting tool. You’ll need to set up a list of people who will participate and then ask each of them to enter ideas in a single column of the spreadsheet. As each person enters an idea in a cell, others would see the idea and use that as inspiration for new ideas. This process can foster a bit of mild competition if done in real time and can also be fun. If you are using handwritten sheets, ask people to print or write legibly. Ask people to be succinct but to provide enough information for the idea to be understood two weeks later. 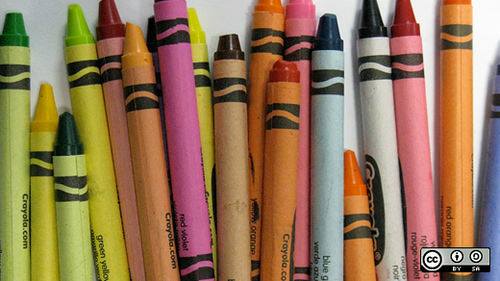 Ask participants to do some easy homework to prepare for brainwriting (and brainstorming). Homework can make the sessions more productive. One example of homework would be to send your problem or question to participants and ask them to jot down or think about three ideas. Make the homework fun if you can. Put the problem statement or ideation question on all of the sheets or write it on a board or slide if you are doing it remotely. If you use the Google Spreadsheet approach, put the question at the top of the spreadsheet. Ask your participants to avoid jargon and acronyms that wouldn’t be understood in a week’s time. Be clear about the rules for sharing idea sheets. If you have people pass them to others, designate the direction of passing the pages to avoid confusion. Set a timer.. Most smartphones have countdown timers that work well for brainwriting. Mix brainstorming and brainwriting with other ideation methods. Brainstorming may generate few ideas, but sometimes the social aspects of brainstorming generate a sense of teamwork and creativity. 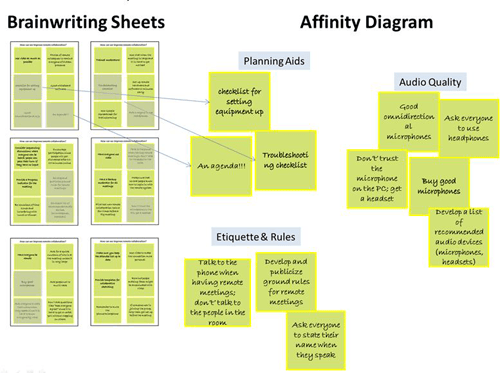 If you want to create an affinity diagram from the ideas, you could prepare pages with sticky notes and then remove them when you are ready to diagram. The image below shows six pages from a brainwriting session on the topic of how to improve remote collaboration. Each page would have six sticky notes on which participants can write ideas for the topic. After the brainwriting is complete, the notes can be organized into categories using the affinity diagramming method. The first selling point is its scalability. You are able to gather data from a few people on your design team to hundreds of people at a conference without great cost or detailed planning. It does not require great facilitation or social psychology skills. All you need is a brief script, some cheap supplies or a remote tool like Google Spreadsheet, and between 10 to 30 minutes to conduct the session. It is efficient.. Unlike brainstorming, with its serial approach to idea generation, everyone is writing ideas at the same time. While brainwriting is generally done in silence, each person is still stimulated from seeing other ideas. Perhaps most importantly, the number of ideas generated from brainwriting generally exceeds those from brainstorming. Enjoy your experiments with brainwriting. The resources listed below are a mix of videos, articles and books. My recent book, Brainstorming and Beyond, has a full chapter on brainwriting (and on brainstorming and braindrawing).